Enjoy Lake Michigan Views from most rooms of this charming home. Beautiful Lakeview Home at 709 Chestnut. Only steps to the beach and Kids Corner. 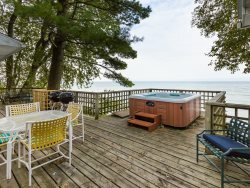 Gallivanting around South Haven and Southwest Michigan will be extra fun and convenient from this classic lake view home vacation rental. Outside enjoy the rockers on the front porch while enjoying the sights and sounds and smells of Lake Michigan. Grill and dine on the back deck with plenty of privacy. Don't forget to grab beach chairs and toys from the garage on your way to the lake. The interior of this home is bright and airy with great gathering spaces while having plenty of room to spread out. Bringing gram and gramp? No worries, because they can always use the handicap stair chair to easily come and go from the upper level. The lower level is an unexpected bonus with a large living space with TV and a game table as well as a full bath. Bedroom 1. Upper level. Queen. Master Suite with sitting area and lake views. Bedroom 2. Upper level. Queen. Lake views. Bedroom 3. Upper level. Queen. Living Room. Main floor. Queen Sleeper Sofa. Bathroom 1. Main floor. Half bath. Bathroom 2. Lower Level. Shower only. Bathroom 4. Upper level. En Suite master. Shower only. The staff was very helpful with helping us find a place that worked for us and graciously helped us with any of our needs. We really enjoyed our stay at the Gallivanting house. Your office staff ( team members )were awesome to work with. Everyone was friendly and wanted to make our stay as pwerfect as possible. Can't wait to return to Gallivanting next year and make more memories!! !